In India, a significant reduction of wheat yield would cause a widespread impact on food security for 1.35 billion people. The two highest wheat producing states, Punjab and Haryana in northern India, experienced a prolonged period of anomalously low wheat yield during 2002–2010. The extent of climate variability and change in influencing this prolonged reduction in wheat yield was examined. Daily air temperature (Tmax and Tave) was used to calculate the number of days above optimum temperature and growing degree days (GDD) anomaly. Two drought indices, the standard precipitation and evapotranspiration index and the radiation-based precipitation index, were used to describe the drought conditions. Groundwater variability was assessed via satellite-based approximation. The analysis results indicate that the wheat yield loss corresponds to the increase in the number of days with a temperature above 35 °C during the maturity stage (March). Reduction in monsoon rainfall led to a depletion of groundwater and reduced surface water for irrigation in the wheat growing season (November–March). Higher temperatures, coupled with water shortage and irregular irrigation, also appear to impact the yield reduction. In hindsight, improving the agronomic practices to minimize crop water usage could be an adaptation strategy to maintain the desired wheat yield in the face of climate-induced drought and precipitation anomaly. Mukherjee, A.; Wang, S.-Y.S. 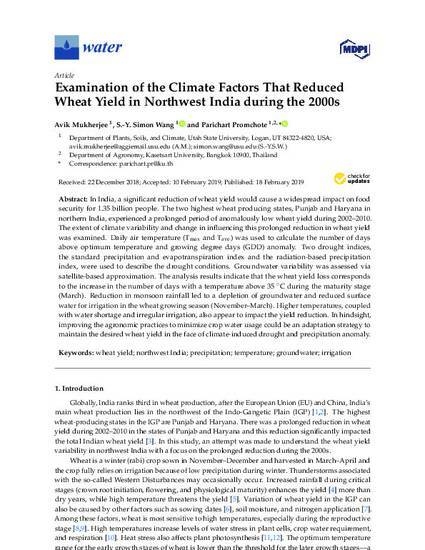 ; Promchote, P. Examination of the Climate Factors That Reduced Wheat Yield in Northwest India during the 2000s. Water 2019, 11, 343.